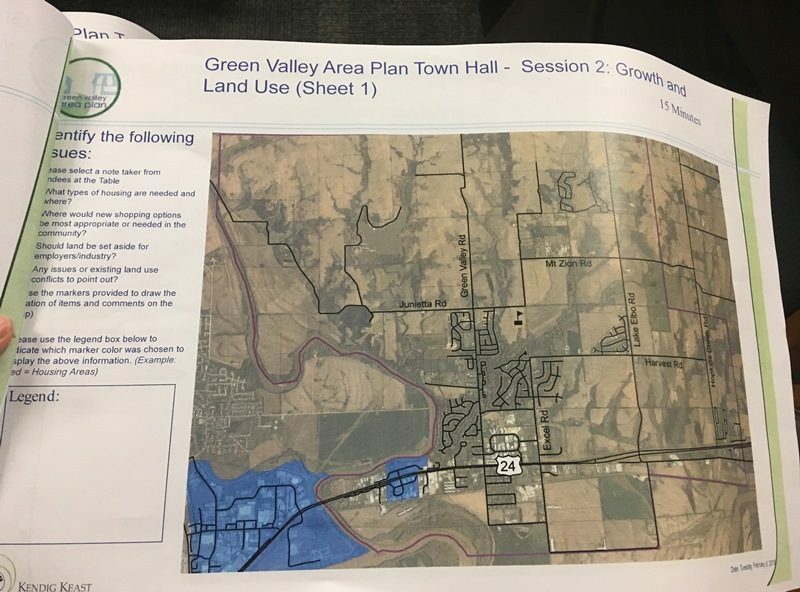 Map of area in Green Valley Governance Plan proposal. Photo by Hailey McClellan/KMANMANHATTAN — A big decision looms over residents in and around the Blue Township area. As the area of about 4,000 residents continues to grow, it’s become apparent there is a need for some type of public services in that area, including water and sewer, parks and recreation and others. 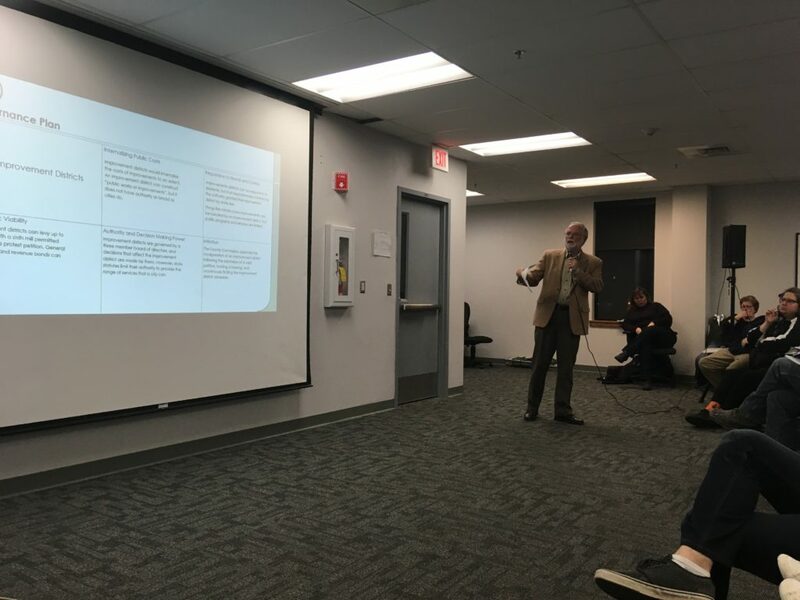 During the Green Valley Governance Plan town hall meeting Monday, Jim Kaup of Kaup Law Office in Topeka presented residents with some different options for governance plans and asked for feedback. 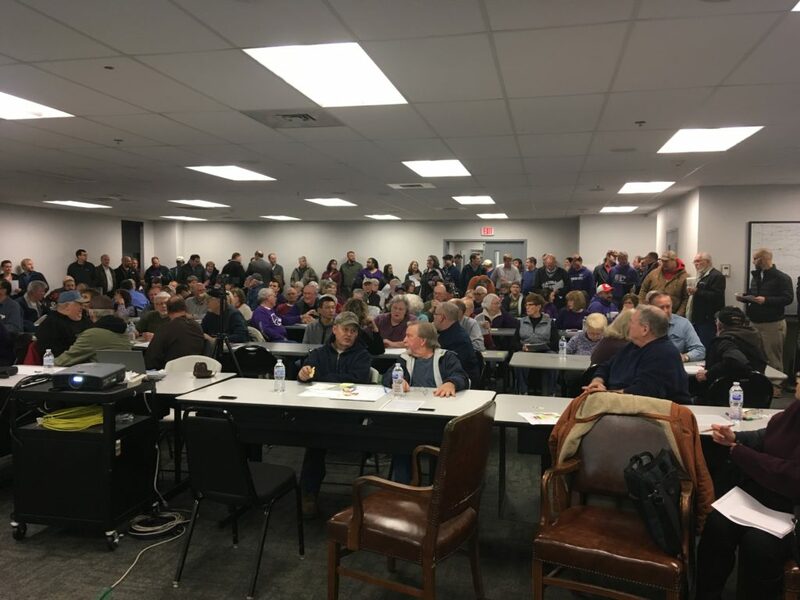 The meeting was well attended with residents packing the National Guard Armory on Levee Road in Manhattan to share their concerns with the project. Some favor some sort of annexation of services or possibly incorporation into a city of its own for the area. Others, like resident Prudence Fager believe the area is fine the way it is. She spoke with KMAN about where her interests are. Fager says she believes the services they have in the area are good enough and isn’t looking for much of a change. Sage Tebeest, a member of the steering committee for the Pottawatomie County Comprehensive Plan explained her interest in attending Tuesday’s meeting. Tebeest says residents need more specific information about these governance options. Once Pottawatomie County officials compile the results from Tuesday’s meeting, Kaup will present it to the Board of County Commissioners and his report will also be available on Pottawatomie County’s web page. Manhattan city officials are looking into costs surrounding both the potential incorporation or annexation of the Green Valley area as residents weigh their options. Manhattan Mayor Mike Dodson spoke with KMAN ahead of the Green Valley governance plan town hall Tuesday. He says the discussion has a couple of components to it — one being emotional, and the other being cost-based. Manhattan City Manager Ron Fehr says the Manhattan has already extended into the area in terms of service contracts, specifically related to water and sewer as well as street signal maintenance. The city is preparing cost analysis to determine potential tax burdens for residents should they choose to annex into Manhattan or if they choose to incorporate into a city of their own.